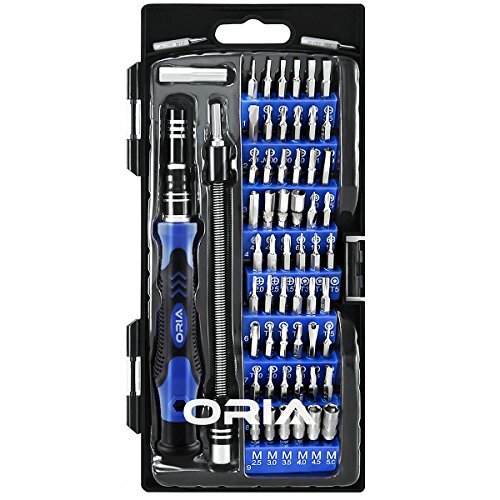 Oria Magnetic Driver Kit is designed to meet all your demand to repair popular laptops, phones, game consoles, and other electronics. Our Magnetic Driver Kit is Ideal for the preservation and maintenance of the precise work and the optics facilities, such as precision watches, mobile phones, televisions, mobile phone, PDA, PC & other applications. Multi-Magnetic Screwdriver – 60 in 1 Precision Screwdriver Set is designed to service all popular laptops, phones, game consoles, and other electronics. Variety of Bits – 56 different kind of bits made of chrome-vanadium steel are carefully selected by Oria to meet all your need. Flexible Shaft – A flexible shaft is included, which is great for stereo work as well as other large electronics where the screws are not on the surface. High Quality – The Unique non slip driver in the market is machined from a single piece of aluminum, and cover with the Silica gel, it also with a ball bearing mounted swivel top to make the work more easily. Portable – Professional portable hardware tools with perfect weight & compact design for easy carry.